The SoCal reggae scene is bursting at the seams with old, new and just emerging artists. With this kind of saturation it can be hard to get heard above all the noise, but one so called “Super-Group” is putting a new twist on some old school sounds, mixing roots reggae with hip hop and other influences. Skanks Roots Project is a California-based group that consists of: Dj Skanks, Eddie Blunt (High Tide), J. Rips (KeepItLit), Dave Torr (Mad Traffic), Danny Dread (Roots Covenant), E.N Young (Tribal Seeds), and Animo. Other notable tracks off the album are Life Undefined (Featuring Aaron Borowitz of Thrive) and Hit It, a breezy feeling acoustic guitar driven track featuring Danny Dread, Mis Lee Ding and J. Rips. 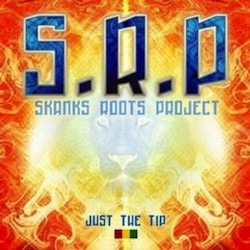 As the title states “Just the Tip” is just the beginning of what Skanks Roots has to offer to the musical world. The group is already back in the studio working on the next EP, expect big things from this Cali-based collective of superb artists.